Two solar sculptures gently floating above an industrial town in Germany brought in mind our desire of escaping the Anthropocene and entering the Aerocene. A sand quarry has exactly the sound of the Anthropocene. The conveyor belt for wheeling sand around the working area has that high-pitched tone that sticks into your head and forces you to focus on it. On Saturday we tried to cover that sound with the delicate melody of two solar balloons. Our new Aerocene sculptures managed to capture even those very few golden rays of sun that peaked through the cloudy autumn sky and, using just air, left for their zero-fuel journey above Germany. We arrived at the location at 7 a.m., just as the sun started to rise over the horizon. Aerocene sculptures fly due to the temperature difference between the envelope interior and its surrounding air. At that time of the day, the air is still cold from the night, and it makes for an ideal time for a launch. If you act fast and catch those first sun rays before the air around it warms up, then the sculptures can take off in no time. And we saw it happening; in a matter of a couple of hours, we managed to inflate the Aerocene sculptures and saw them take off - with only 1 degree of temperature difference. The two giant three colored sculptures, an icosahedron and a tetrahedron, are the biggest ever produced for a free flight, with their 8 m of diameter. Unfortunately, they flew for only 10 km this time, as the clouds covered the sun reducing the irradiation, forcing them to land in a nearby forest. 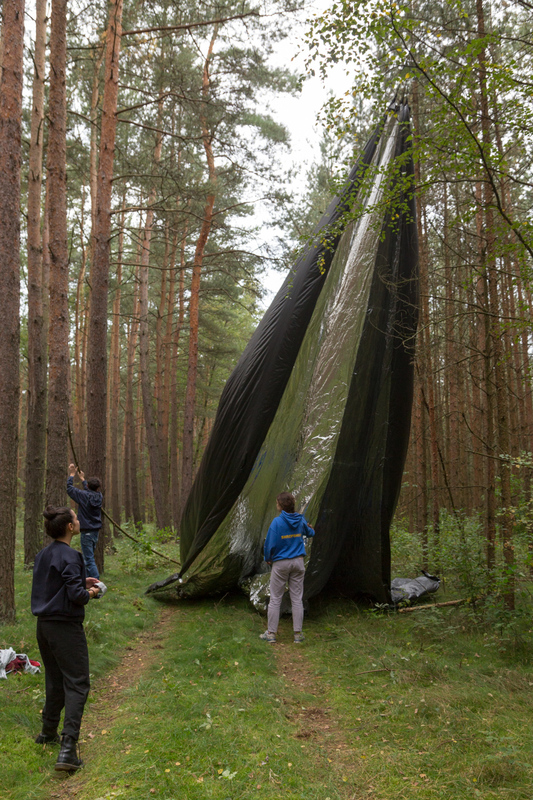 Aerocene is a project celebrating our relationship with nature. Nothing exists in a vacuum, everything is connected and everything is being affected by what is happening next to it. It is an appreciation of these delicate relationships. If we develop a sensitivity towards these connections then we can start creating in harmony with them. On Saturday, flying above the industrial site, we dreamt of a time when we will break free from our parasitic practices towards nature. For a few hours, we were not in the Anthropocene anymore; we were living in the Aerocene era. When one happens to be under an Aerocene balloon, holding it while it is inflating, one can feel the energy emanated by the sculpture, which reflects the real potential and strength of the Earth, the Air and the Sun dancing together to their own tune. All of a sudden, you just realize how small we are, part of an intricate system of causes and effects in which we are just joints of a bigger natural mechanism, and have no right to own nothing. The time for the Anthropocene is over: as soon as we recognize it, we will have more chances to lay the groundwork for the new Aerocene epoch, thinking by doing, thinking actively towards a new equilibrium between the elements, to overcome the erroneous dichotomy between man and nature and to re-learn how to inhabit our planet. Our dream is to develop real possibilities and alternatives to push our species towards an harmonious coexistence with nature. What we achieved on Saturday is a very encouraging result that fills us with hopes and dreams for the future of what is possible. Aerocene is an era where people work in harmony with our environments but also with each other. As part of this epoch, for the past few months we have been collaborating with the London-based designer and RCA student Grace Pappas to produce a series of experiments using the Aerocene and the possibilities it opens up as a platform. Materials exist in an inseparable bond to their environment and the different forces that act upon them. Pressure, temperature, gravity, time; all affect how materials exist in a specific moment in a particular location. Along the same principles, Grace Pappas developed a series of objects that are sensitive towards the environment the Aerocene flies in. She created loads of playful prototypes that react to pressure and temperature, some more simple and some more elaborate. For example, we wanted to release a trap during the flight to study the complex form of life that exist in the air. Aerocene does not leave a trail of pollution behind itself. This means that any experiments in air quality or biodiversity will be more accurate than data collected using more obtrusive means. Reflecting a similar narrative, Grace created for our Aerocene Hack an insect collector that opens and closes using air pressure, to capture and protect insect samples. For this Free Flight, she created a release mechanism using ice. Two pieces of string, one attached to the sculpture and one attached to the insect collector were frozen together in a small block of ice. Some time after takeoff the ice melted, allowing the collector to drop. In addition, she created a performative pressure sensor that moves in reaction to the air pressure differences experienced during a flight at high altitude. Pressure, air volume and temperature lay on the same function; when you change one, the other two get affected. For example, if the pressure for a given amount of air drops, then its volume expands. Similarly, when the temperature drops, the air contracts. Drawing from that principle, she created an object that moves as the air pressure changes. To achieve that, she insulated a series of pistons, to minimize the effects of temperature to the air and attached them to a dial that would display the air expansion during the flight.